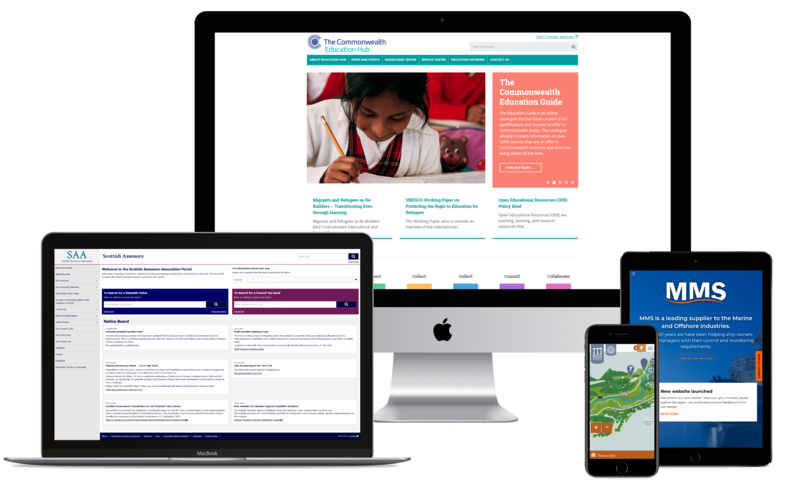 In September 2017, Cafcass appointed Connect to migrate and refresh their website with a spacious, contemporary design that reflects the body’s role at the centre of the judiciary system in the UK. In order to deliver a compelling solution, we set out to understand objectives before putting pen to paper and starting creative work. We utilised a strategic delivery approach which considered requirements from the outset. Following a collaborative discovery phase, we re-engaged to create and implement the design. We became an extension of their team, working to improve the experience for users and editors alike. 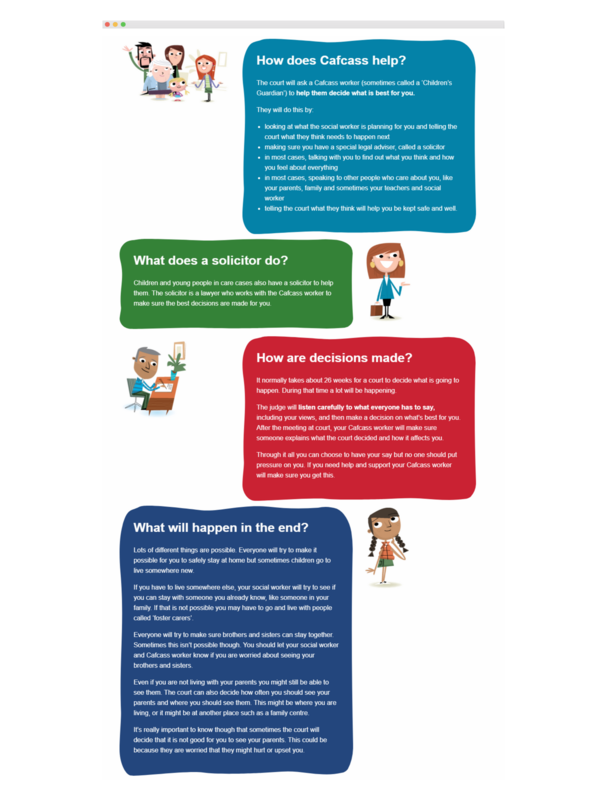 As the content housed on the site covers a number of topics, including adoption, care proceedings, domestic abuse and surrogacy, the visual design and information architecture needed to cater for multiple audiences, including young people, parents & carers and professionals working within the family justice system. Our agile approach ensured that the site acts as a gateway to the content Cafcass has to offer. Focus was placed on creating a design that communicates empathy – the website must establish a connection with each user, so that interaction is positive, and they can find what they are looking for quickly. 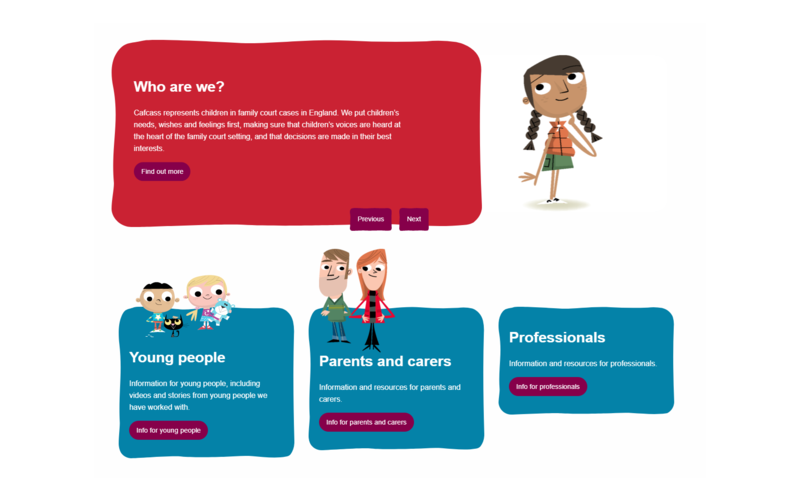 Unique character illustrations help to drive Cafcass’ story and affirm their independence. Imbuing characters with humanity was important to create a connection with the end user. This is one of several aspects that helps to provide a positive, dynamic feel, reflecting the benevolent roots of the body. Content cards and sliders provide greater flexibility for Cafcass when it comes to highlighting important content, ensuring the site always appears fresh. With concise, colourful headers, users can find and navigate to important areas in just a few clicks. The functional user interface helps to improve perception of the site. White space also plays an integral role in the visual design, improving text comprehension, focus and interaction in order to maintain composition and balance. 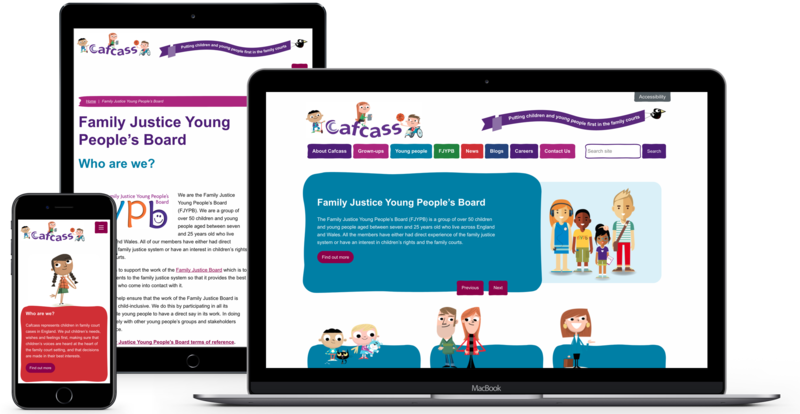 Through the design, build and delivery of a rich, responsive website with informative content, we utilised digital technology to better serve Cafcass’ audiences. We have enhanced the user experience, made interaction more intuitive and improved access to content. In doing so, we have aided Cafcass’ long-term objectives and provided an enduring platform that will inform and provide help to users for years to come.